Some of my favourite memories are of watching Saturday morning cartoons at my Grandmothers. I would wake up early and turn the TV on and wait for my favourite shows to come on. I remember being glued to the TV when Transformers would come on. While the most recent Transformers movies are not suitable for my children to watch I can still share the fun and excitement of the “Robots in disguise” with toys like “Power Charge Bumblebee”. 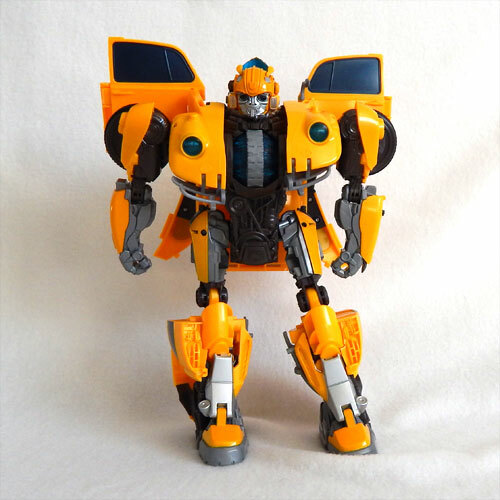 “Power Charge Bumblebee” stands at approximately 10.5 inches in his Robot form. Spinning the Power Charge core (the wheel on his chest) activates the lights, sounds and phrases. Bumblebee takes 1 AA Battery, there is no on/off or volume switch. Get Bumblebee ready for battle. Lower his battle mask and move the slider to reveal his Stinger Sword. 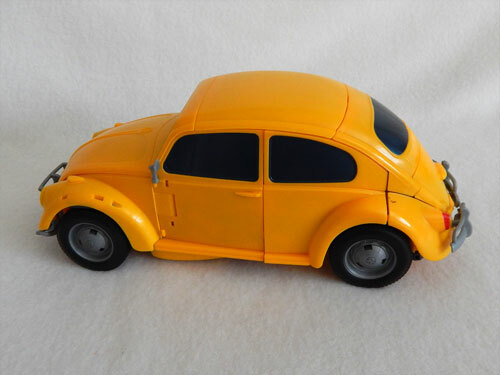 When you are ready to hit the road, transform Bumblebee into the classic yellow Volkswagen Beetle car. The instructions show a series of step by step instructions to transform him from robot to car. I found the instructions difficult to follow, finding myself lost part way through. It took me approximately a half hour to figure out how to transform him. 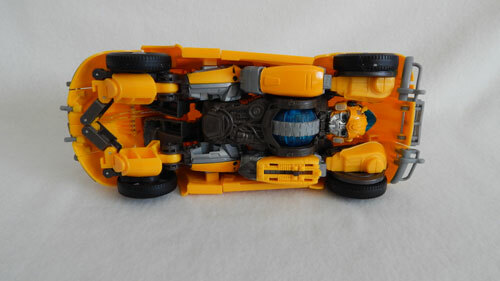 While the instructions are difficult to follow, it has proved almost impossible to transform Bumblebeee without following them. While assembling Bumblebee into his car form, we found that the tabs didn’t fit into place. In one case we had to trim one to make it fit. There are still a few places that the pieces didn’t exactly fit together the way I feel they should, but this could be due to errors on my part. The wheels do not turn easily, the Power Charge wheel gets in the way. The box says it is intended for children aged 6+, but I feel that it is for children older than that. Children will enjoy playing with him as a robot or car, but the transformation process is frustrating and difficult. As a car, Bumblebee’s wheels do not turn smoothly. The Power Charge Wheel and his arms seem to get in the way. 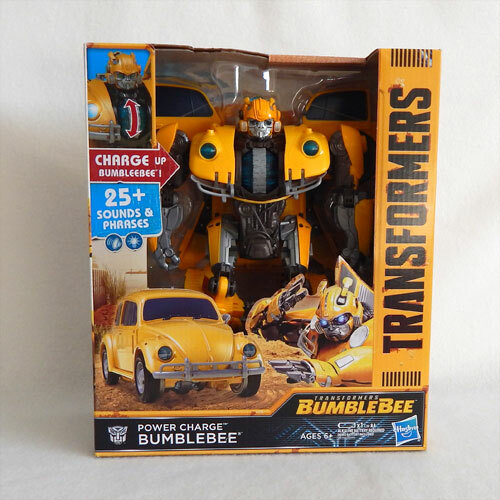 Transformer fans will enjoy “Power Charge Bumblebee” as a display piece. He looks great as a showpiece on the shelf, but as a toy it has been disappointing. *Disclosure: I received a complimentary “Power Charge Bumblebee” through the Amazon Vine Program in exchange for my review. All opinions are 100% my own.